Check out our selection of fielding aids for infield practice. Improve your defensive skills with these training aids for baseball & softball fielding. The Reaction Ball is a fielding aid that dramatically improves baseball fielding skills and hand eye coordination. Simulates the bad / unpredictable hops. EvoShield’s Protective Wrist Guard works great at the plate and in the field, and is especially useful for catchers. It provides the compression of tape, the comfort of cotton, and the protection of a Shield. Available in Small, Medium, Large and XL. Give your glove the perfect pocket! The Coach's Glove Mallet is a solid wood, handcrafted mallet used to help break in and establish the Perfect Catching Pocket in a new baseball/softball glove. It also helps protect and maintain the pocket in your existing glove. Available in baseball and softball models. Field the ball with two hands! This Infield Training Glove (commonly called a pancake glove) forces a fielder to use two hands when fielding the ball. Pancake gloves are a great fielding aid to develop the proper defensive mechanics. For baseball or softball and players of all ages. The REAKTR Protective Fielding Glove keeps your hands dry and connected to your glove. Designed to enhance the fit and comfort of your fielder's glove while cushioning the hand against bone bruises from bad hops. Ideal for catchers and all infielders. Available in Adult sizes SM-2XL, in Black. FREE SHIPPING! The ACCUBAT enables instructors of all abilities to hit grounders, pop-ups, and line drives consistently and accurately. Choose from 2 models. The SkyBat is the most effective way to coach your player and your child with fly-balls pop ups and grounders. It uses a tennis racket design, but has a completely custom combination of string, tension and weighting that allows it to hit a real baseball or softball and never break. FREE SHIPPING! The Sling Pitcher is a versatile, easy-to-use softball and baseball launcher / pitching machine. 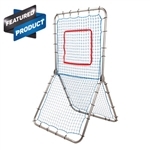 Works great for consistent infield/outfield practice and can throw pitches up to 70 mph along with grounders, pop-ups and fly balls. FREE SHIPPING!